In addition to being the governor general of Canada’s official residence and the meeting place for foreign dignitaries visiting Ottawa, Rideau Hall is a serene green space beloved by locals and travelers alike. The manicured grounds contain a vast lawn, rose garden, private greenhouse, and more than 10,000 trees—some planted by famous visitors. 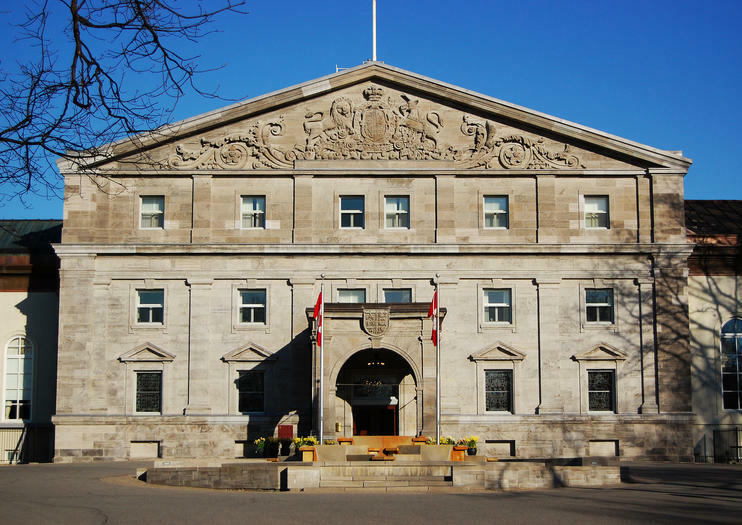 Built in 1838, Rideau Hall became home to Canada’s governor general in 1867. The 175-room Federal Heritage Building is the site of various ceremonies and state affairs, and where the British royal family stays when visiting the capital. The grounds reflect Canada’s diversity and openness through art, artifacts, and horticulture. At the gates, visitors will find the Governor General’s Foot Guards standing at attention outfitted in red coats and tall bearskin hats. The changing of the guard at Rideau Hall is a popular summertime draw. Some bike tours of Ottawa take in Rideau Hall, though many folks visit independently. Guided tours of the grounds are available daily May to October, and the residence is open for tours year-round; check the website for schedules and reservation information. Rideau Hall is ideal for those who appreciate history, art, and architecture, and for all first-time visitors to Ottawa. All activities, including tours, are free of charge. Tote a picnic to enjoy in the landscaped park, on the lawn, or with the kids in a play area. Cricket games are played on the lawn during summer, and an outdoor skating rink is available in winter. The residence and grounds are accessible to wheelchairs and strollers. The latter are available for use at the visitor center and the residence. Rideau Hall is located at 1 Sussex Drive, across the street from the official residence of Canada’s prime minister. It is easily and quickly accessible from downtown Ottawa by public transit, car, taxi, or bicycle. Street parking is available in the neighborhood. Rideau Hall is open from 8am until one hour before sunset throughout the year. The visitor center is open May to October. Activities and special events take place year-round; note that visiting dignitaries and various goings-on may affect opening hours and access. This bike tour is perfect for families and those wanting a leisurely way to see Ottawa. Most of the route is on designated bike paths that take you to some of Ottawa’s cultural and natural highlights. You’ll see Rideau Falls, cycle the Rideau Canal path, cross the river into Gatineau, plus see the War Memorial, Parliament Hill, National Art Gallery, Museum of History, and more. Experience the beauty and history of Ottawa on a bike tour in and around the city. See all the major sites while enjoying the natural pathways and waterways of Canada’s capital city, and enjoy a stop for lunch at a local cafe.